1. A country’s international financial strengthness determines on the basis of favorable balance of trade. It happens when export is more than import. 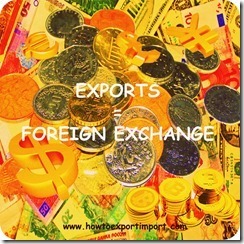 Foreign exchange earnings will be more in a favorable balance of trade. So the wealth of a nation increases while earning foreign exchange. 2. Government supports: While supporting to increase foreign exchange inflow to a country, government supports in maximum ways to safeguard the exporters in almost all their problems and threats in the form of funding as well as services. 3. You will maintain quality as per international standard, while meeting the quality requirements of foreign buyer. This will increase your confidence in building up your business world, as delivering best quality pays society always best. 4. Compared to domestic market, quantity of exports will be more in turn the profit. prashant sharma: On 26 January 2014 how we can receive import export contract form ? which is issued by govt. as for as complete legal formalities. Dominic Stevenson: On 18 February 2015 I am very keen on starting an import/export business and am looking for a mentor and guide.I would very much like to learn from you and take your assistance in this.I am currently in Dar es Salaam, Tanzania on a project that ends next month, August, andI should be back in India around that time.I will explore what opportunities are here as well. sarvesh: On 02 July 2015 Hi All if you want to import/export data for any country from india. we sujest to content to Seair.co.in. it is best import/export data provider compnay in idnia . rajkumar kumar : On 21 July 2015 sir can u say me about this export and import company.because I didn't know where to start and while I start this business how much my investment should be and what type of products can we export or import from or to india. Bright Burnishing Tools(NS) : On 21 July 2015 we are planning to start a new company focusing Export Trading business. I saw yourblog in the internet .Please let me know what kind of Guidance/Support you can offer to us especially in Marketing and Identifiying the products that can be exported. Ganesh Kumar: On 30 August 2015 I want to start Export business how do I get IEC? and How do I get buyers contacts? Prime : On 16 August 2016 I m dealing with agate stone products. Now i m planning for exports. I have made Ecommerce site but have less knowledge for exports, need ur help. Tanya: On 01 May 2017 Thanks For sharing this type of knowledge.